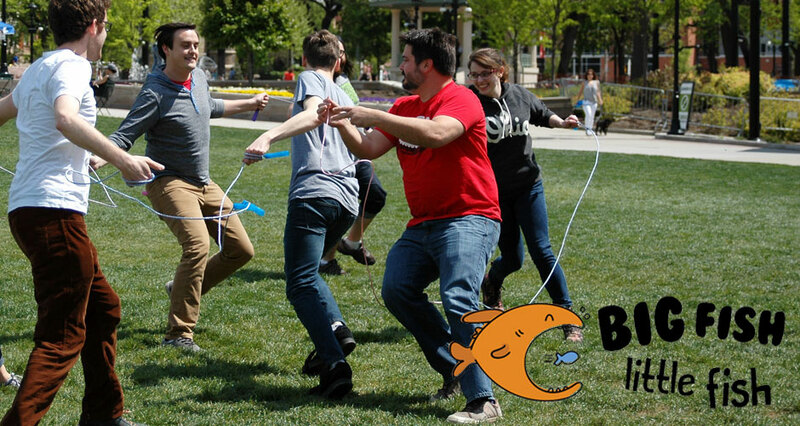 Big Fish / Little Fish is a fast-paced field game for 8+ players in which teams of players connected by jump ropes attempt to surround other teams, consuming and absorbing them with the ultimate goal of subsuming all players into a single big fish. Little fish need not despair however because by surrounding a single player on either end of the big fish they can slowly break the big fish back down into its constituent little fish parts. Big Fish / Little Fish has the fast paced chase of Tag, the hilarious complexity of taut, tangled ropes, the tactical confusion of coordinating frantic players to move as one, and the satisfying variety of back-and-forth goals. Denver Coulson is an independent game developer who does most of his work through 11:11 Studios. His current interests and work have a strong focus on interaction design. His games can be found at http://elevenstud.io. Ben Sironko is an experimental game designer. His games can be found at bensironko.com. Ben and Denver met as undergrads at Miami University and have collaborated on a number of projects.